One of the classical hallmarks of the musical genre is the duality of the characters, the situations, the scenes, and the shots. We certainly see this in the 1952 classic “Singin’ in the Rain”, staring Gene Kelly, Debbie Reynolds, Donald O’Connor, and Jean Hagen. However, in the Altman reading “The Structure of the American Film Musical” he states that “an interesting variation on the traditional paired-scene arrangement involves the introduction of one or more wrong couples. This is Don and Lena. As the film suggests, all the Hollywood wags want them as a couple but they are not “Fated to be Mated” as the film progresses. They present the exterior expected relationship that the public wants to see but they are not really a couple, much to the protests of Lena. Don is finally introduced to Kathy Selden, a poor chorus dancer/singer. Initially she is the opposite of Don. He is a star. She is a chorus dancer. He is dress formally (although a little tattered from girls mobbing him). She is dresses plainly. He is in formal black and white. She is dressed in plain brown and grey neutral colors. He wants her. She resists him. This presents the classic duality of the American Musical genre. The mating ritual between Don and Kathy culminates with the scene when the two enter “the empty stage” and then dance to the crooned song “You Were Meant for Me”. The narrative is not the essential element of the American Musical genre. 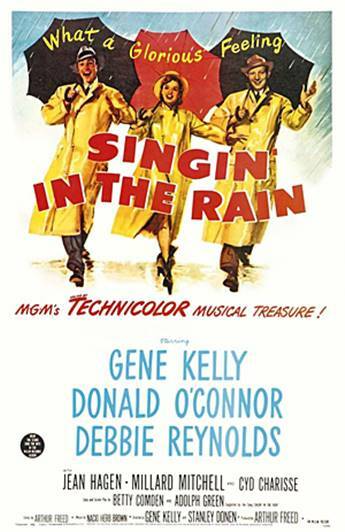 We do see a general story for “Singin’ in the Rain”. However, the story is there to deliver the setups for the song and dance scenes.